It is disturbing to contemplate the fact that 100 years ago, more Americans believed in the God of the Bible. The universal teaching of the public schools was Creation as depicted in the Bible. In stark contrast, we have lived to see an unbelievable transformation in which the universal teaching of the public schools is evolution, we have filled our university faculties with atheists, and we have banned God from the public square under the guise of “separation of church and state.” The impact on the thinking of children who are now adults has been catastrophic. But on the Day of Judgment, there will be no excuses. Every accountable human being on the planet can know that God exists. The created order possesses characteristics that inherently demand the existence of a transcendent, supernatural Creator. As a matter of fact, the evidence that exists in the material order—the Universe/cosmos, the planet Earth, the animals, the plants, and the human body—communicate the clear message that all owe their origin to the divine Creator. This message is being continually communicated all over the planet regardless of geographical location, time of day, and language spoken (Psalm 19:1-3). In the previous article, we mentioned very briefly several marvelous, convincing evidences for the existence of God as seen in the remarkable human body and some of the features of the created order—phenomena inexplicable apart from Almighty God. We now turn to more of “the things that are made” (Romans 1:20)—additional decisive evidence—that also offers amazing proof of the great Governor of the Universe. One feature of the Earth that proves the existence of the God of the Bible involves symbiotic relationships. Although definitions and distinctions abound, generally speaking, symbiosis refers to a close, usually obligatory, association of two or more plants or animals of different species that depend on each other to survive. Each gains benefits from the other. These include both mutualistic and parasitic species. Obligate interactions exhibit considerable specificity and typically involve interaction with only a single species or genus. For example, a large percentage of herbivores have mutualistic gut fauna that help them digest plant matter, which is more difficult to digest than animal prey. One species of butterfly employs complex chemical and acoustical signals to manipulate ants. Coral reefs are the result of mutualisms between coral organisms and various types of algae that live inside them. Most land plants and land ecosystems rely on mutualisms. Plants convert carbon from the air. Fungi help in extracting minerals from the soil. Many types of tropical and sub-tropical ants have complex relationships with certain tree species. Those plants and animals that both need each other to survive would have had to come into existence close in time to each other. They most certainly could not have been separated from each other by millions or billions of years of alleged evolutionary adjustments. They would have had to have been created by the Creator to function precisely the way they function. Such massive complexity, interdependency, and sophisticated diversity scream divine design. Take, for example, the interior of the human mouth. Setting aside the incredible design necessary for the mouth to function, including teeth, gums, tongue, lips, muscles, nerves, cells, etc., all of which must work together from the beginning if the individual is going to receive nourishment to survive, evolution simply cannot provide a credible explanation for the condition of the human mouth on a microscopic level. 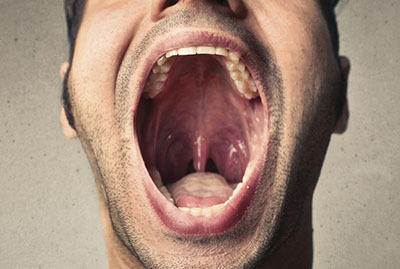 Microbiologists estimate that over 700 distinct bacterial species are present in the mouth. How could 700 separate creatures come together in one place to create a complex ecosystem of mixed organisms that co-exist with each other to perform marvelous feats of chemical engineering—from breaking down food particles and mopping up shed body cells, to competing with intruder organisms to protect us from infection? The complexity is inexplicable in terms of evolution. This sophisticated arrangement had to have been created by God. Another amazing proof that divine Creation is true and evolution is false is seen in the relationship sustained by the Egyptian Plover bird and the Nile crocodile. Africa’s largest crocodilian, these primordial brutes can reach 20 feet in length and weigh up to 1,650 pounds. Their diet entails mainly fish, but they will attack almost anything: zebras, small hippos, birds, porcupines, and other crocs. They are ambush hunters—they wait for fish or land animals to come close, and then rush out to attack. 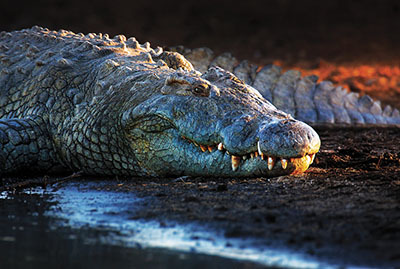 They are vicious man-eaters: up to 200 people die each year in the jaws of a Nile croc. Despite these facts regarding the deadly nature of the Nile crocodile, it is absolutely astounding to learn that the Egyptian Plover bird has a symbiotic relationship with this creature that entails entering the croc’s mouth for the purpose of cleaning its teeth and gums. The croc will open its mouth and allow the bird to enter, sometimes keeping it open and sometimes closing it gently with the bird still inside. The bird then uses its beak to remove parasites, leeches, worms, and bits of food that infest the crocodile’s mouth. The Plover enjoys a ready source of food, and the crocodile gets a valuable teeth cleaning to promote health and minimize disease. Such an arrangement could not have evolved. No crocodile could have gradually decided it was in its best interest to let a bird clean its mouth. Such sophisticated relationships among diverse creatures prove pre-planning and programming—intelligent design by the Master Designer and Creator. Another astounding example of symbiosis that demonstrates the existence of God pertains to the Emerald Cockroach Wasp and the American cockroach. The latter insect is six times larger than the Emerald Wasp. Yet, the wasp enacts a brilliantly strategic sting into the central nervous system of the cockroach to cause temporary paralysis of the front legs. This temporary paralysis allows the wasp to deliver a second sting into a carefully chosen spot in the brain ganglia to control the escape reflex. The brain sting causes a dramatic behavioral change: the cockroach becomes passive and zombie-like. Its breathing slows, and it makes no attempt to escape. As a result of this sting, the roach will groom itself, become sluggish, and fail to show normal escape responses. 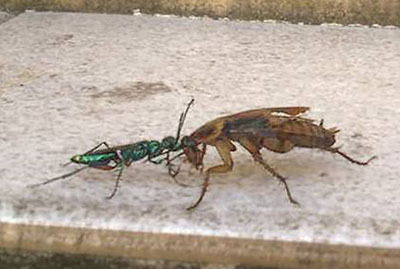 The wasp then leads the cockroach by its antennae, like a leash, to the wasp’s burrow. The wasp does not have to drag the cockroach, since the roach willingly walks on its own legs. Inside the burrow, the wasp lays a white egg, about two millimeters long, on the roach’s abdomen. It then exits and uses debris to barricade the defenseless roach inside the burrow (to keep other predators out). With its escape reflex disabled, the stung roach remains calm and complacent as the wasp’s egg hatches after about three days. The hatched larva drills a hole into the leg of the cockroach to retrieve nutrition from the blood system of the roach for four to five days. Then the larva burrows into the abdomen of the cockroach, crawls inside, and over a period of eight days, consumes the roach’s internal organs in an order which guarantees that the roach will stay alive, at least until the larva enters the pupal stage and forms a cocoon inside the roach’s body. Six weeks from the first sting, a new adult wasp emerges from the hollowed out dead body of the roach. The venom of the Emerald Wasp is carefully calibrated to shut down signals carried by a key neurotransmitter brain chemical called dopamine. The wasp delivers the sting with the precision of microscopic brain surgery. This remarkable skill could not have evolved. Nor was it learned. It was hardwired by the Creator into each wasp—making it a natural born neurosurgeon. The offspring of the wasp literally depend on the perfect execution of the mother’s sting. Too much venom, and the cockroach would immediately die, eliminating the wasp offspring’s fresh food source. Too little (or poorly aimed) venom, and the roach would escape. Millions of years of trial and error cannot be the source of this relationship. Failure of any one step in this complex process would prevent reproduction—and terminate the species. Can such design, complexity, order, purpose, and intelligence come out of mindless, evolutionary chaos? Absolutely not. The Emerald Wasp and the American cockroach were created by the Creator to function precisely as they do. “O Lord, how manifold are your works! In wisdom have you made them all; the earth is full of your creatures” (Psalm 104:24). The Creation declares the reality of the Creator. Leafcutter ants nest in underground chambers in the Amazonian rain forest of Brazil. They regularly leave their nests to forage hundreds of feet into the forest. Most tropical plants are permeated by toxic chemicals to deter foragers. So, using specially designed “mouth cutters,” the ants cut out portions of the leaves they find, being careful not to ingest any of the poisonous chemicals. They then transport their cargo back to the nests and deliver it to smaller worker ants. These ants clean the leaves and chew them into pulpy mulch—again, being careful not to “swallow.” They then feed the mulch to another organism that the ants actually cultivate—a fungus. This fungus breaks down the toxins in the leaves while generating proteins and sugars. These proteins and sugars constitute the food that the ants eat. The ants need the fungus for food—and will die without the fungus. The fungus, on the other hand, cannot live without the ants, since they are dependent on the ant to bring the leaves. This is a mutual co-dependency that could not have evolved. Incredibly, this particular fungus grows only in the underground chambers of the Leafcutter ant’s nest. And the fungus will not consume all leaves, since some are toxic to the fungus. The Leafcutter ants are sensitive enough to adapt to the fungi’s preferences and, hence, cease collecting those leaves. Scientists think that the ants can detect chemical signals from the fungus which communicate the preferences of the fungus. What’s more, researchers have identified an aggressive mold that threatens the fungus. When the researchers remove the ants from the nest, the mold destroys the fungus. Entomologists have discovered that the ants—especially the ones that tend the fungus—have a white, waxy coating on their body. The coating, which fights the mold for the fungus, has been identified as tangled mats of bacteria that produce many of the antibiotics that humans use for medicine. The ants are essentially wearing portable antimicrobials. Yet humans only discovered antibiotics within the last century. No wonder Solomon observed: “Go to the ant...consider her ways and be wise, which, having no captain, overseer or ruler, provides her supplies in the summer, and gathers her food in the harvest” (Proverbs 6:6-8). About 50 species of yucca plant grace the planet. 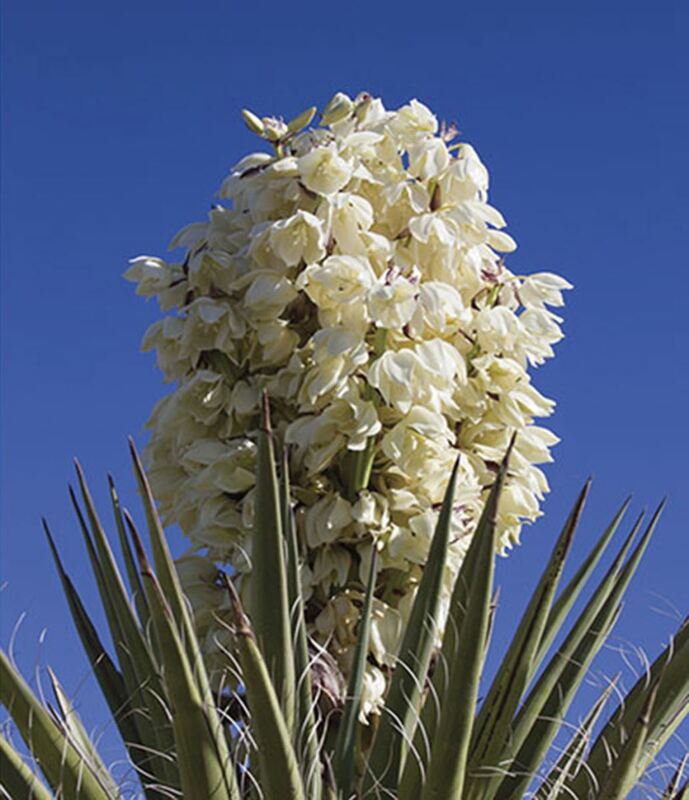 Incredibly, the yucca plant is completely unable to pollinate itself in order to grow more seeds and reproduce. It is wholly dependent on the genetically programmed yucca moth to facilitate reproduction and perpetuate the species. From their subterranean cocoons in spring, male and female yucca moths crawl to the surface and fly to nearby yucca plants. Yucca plants are just opening their flowers. The female yucca moth collects pollen from the yucca flower and fashions it into a sticky ball, using a pair of long, curved “claws” (proboscis) protruding from her mouth area, to collect, form, compact, and carry the golden pollen ball. The yucca’s pollen is in a curved region of the plant. Only the yucca moth has the specially curved proboscis to gather the pollen from the plant’s male reproductive organs. Having collected the pollen, she then flies to another plant where she inserts a moth egg into the ovary wall of the yucca plant, using her ovipositor—itself a marvel of engineering design. Still carrying the pollen ball in her facial claws, she climbs to the top of the ovary. She presses the pollen into the stigma, fertilizing hundreds of immature seeds inside. When the moth larvae hatch, they feed on the seeds of the yucca. If they were to eat all the seeds, the yucca plants would stop reproducing, and both they and the moths would cease to exist. God designed the moth to calibrate the number of larvae growing inside each flower so that all the yucca seeds will not be consumed. The life cycle of the yucca moth is timed so the adult moths emerge in the spring exactly when the yucca plants are in flower. The yucca moth and yucca plant were designed to function together. They had to have been created in close temporal proximity. No wonder evolutionary biologist Dr. Chris Smith conceded: “It is pretty mind-boggling to imagine how this arose. It’s very strange.”6 “Mind-boggling”? Absolutely. “Strange or inexplicable”? No—unless you ignore, reject, or dismiss the obvious. 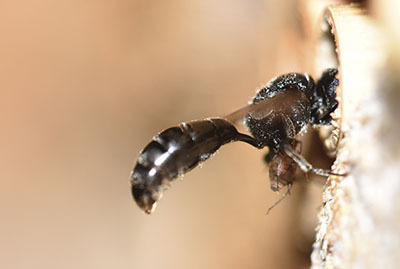 When plants in the southeastern United States are besieged by aphids—small sap-sucking, extremely destructive insect pests—they release a chemical mist that signals black wasps to come to their rescue. Upon arrival, wasps do not kill the aphids outright. With clinical precision, the wasps inject a single egg into each aphid’s body. Each wasp can inject eggs into 200 aphids. The aphid’s body then serves as the incubator for the offspring of its predator. As the ravenous wasp larvae grow, they literally eat the aphid alive from the inside out until they are ready to emerge and begin the process all over again. Observe that this divinely designed means of controlling the aphid population is simply one marvelous system among others. The diversity and complexity of a variety of systems, all working in concert in the natural order, imply an overarching, overruling master plan to ensure the ongoing perpetuation of the created order. 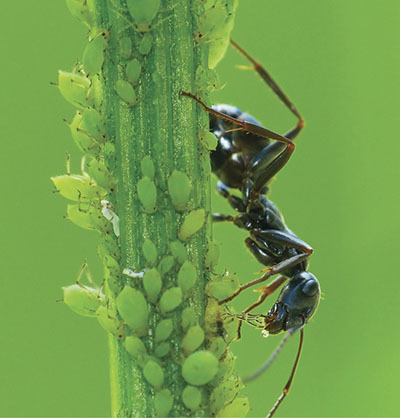 In addition to the black wasp, ants also participate in controlling aphids. Aphids sustain another complicated relationship. They are equipped with special, syringe-like mouth parts to pierce plants and retrieve fluid from them. Some species of ants literally “cultivate” the aphids by “milking” them without harm to the insect. Ants stroke the aphids with their antennae, causing the aphids to secrete honeydew which the ants can then consume. The aphids, therefore, provide a ready food supply for the ants. In exchange, the aphids receive protection since the ants act as a team to fight off invaders and predators, like ladybugs. But this interrelationship goes even deeper. The sap which the aphids retrieve from plants is rich in carbohydrates, but lacks essential amino acids—which aphids cannot synthesize. Enter a third actor in this mutualistic drama: tiny endosymbiont bacteria (Buchnera aphidicola). These bacteria live in the aphid’s special cells called bacteriocytes. The amino acids are supplied by these bacteria. Neither the bacteria nor the aphid can exist without the other. Amazing: the ant depends on the aphid for food; the aphid depends on the ant for protection; the aphid depends on internal bacteria for amino acids; the aphid provides the bacteria with energy, carbon, and shelter inside specialized cells. Symbiosis within symbiosis—decisive proof of divine design! Such remarkable examples of divine design could be multiplied endlessly. They absolutely point to God. But, of course, evolutionists attempt to offer an “explanation” for symbiosis among the wondrous organisms that grace our planet. It goes something like this:9 “Organisms that depend on each other for survival co-evolved, gradually becoming dependent on each other by means of minute changes over millions of years.” Such a claim is then liberally peppered with nullifying qualifications: “Surprisingly little is known about how mutualistic symbioses evolved and persist.” “Despite their ubiquity and importance, we understand little about how mutualistic symbioses form between previously free-living organisms.” “The evolutionary sequence of events in most lineages is unknown.” “Exactly how these associations evolve remains unclear.” “Much remains to be learned about the mechanisms that maintain mutualism as an evolutionarily stable interaction.” Rationally-thinking Christians have a responsibility before God to train themselves to recognize nonsensical gobbledygook when they hear it. The fact is that any alleged “transitions” or “minute changes”—when pinpointed and examined as moments in time—are seen to be unworkable, imaginary, impossible, and nonexistent. Both organisms needed each other from the beginning of their existence. How did these creatures gain nourishment before becoming dependent? Each of these organisms possesses concise design variables that prove the inability of gradual mutation and natural selection as effectual causative agents. Recall the debate conducted in 1976 on the campus of North Texas State University in Denton, Texas, when Thomas B. Warren debated Antony G.N. Flew—at the time, arguably the foremost atheistic philosopher in the world. Flew’s attempt to substantiate the credibility of evolution is seen in this statement: “[I]t is, it seems to me, a consequence of evolutionary theory that species shade off into one another.”10 “Shade off into one another”? Evolutionists attempt to cloud the mind by implying that all organisms came into existence as a result of very slow, almost imperceptible changes over time. But where on the planet are these alleged increments or “shades” from one kind of animal to another? We know chimps exist. We know humans exist. We know nothing of any alleged “shades.” Nor does true science. Warren challenged Flew to face the fact that even if evolution theorizes numerous pre-human ancestors, there had to be a first human being to arrive on the scene. Where did he/she come from? The very first human being on the planet had to come into existence somehow. But how? Was this first human being a male or female? A baby or an adult? In reality, there are only two possibilities: (1) either a nonhuman had to transform into a human during its lifetime, or (2) a nonhuman had to give birth to a human. Philosophically and scientifically, these are the only two possibilities—and neither is tenable. Evolution is not only scientifically unfeasible; it is logical and philosophical nonsense! Indeed, evolution is false, and there is a God. The smaller and deeper we go in examining God’s creation, the more complex, sophisticated, and astounding the discoveries.11 One would have to be prejudiced and deliberately determined to deny God to brush aside the overwhelming evidence of Him in His creation. “The fool has said in his heart, ‘There is no God’” (Psalm 14:1; 53:1). “Stand still and consider the wondrous works of God” (Job 37:14). Indeed, the interdependent, interconnected, interpenetrating features of God’s creation are beyond the capability of man to trace out—let alone to “manage” or “assist.” Neither a pine tree nor a pinecone is sentient. They have no thinking capacity or consciousness. They possess no personhood, soul, or spirit. Pine trees did not get together and discuss the threat of forest fires to their future survival, and then decide to produce pinecones that would remain closed during a fire only to open afterwards. No crocodile convention was ever held in which crocs decided it was in their best health interests to refrain from chomping down on Plover birds while all other animals remained “fair game.” The standard explanations by evolutionists for such wonders of creation are incoherent, nonsensical, and just plain pitiful. Elihu reminded Job: “Behold, God is exalted in His power; Who is a teacher like Him? Who has appointed Him His way, and who has said, ‘You have done wrong’? Remember that you should exalt His work, of which men have sung. All men have seen it; man beholds from afar” (Job 36:22-25, NASB). Indeed, the realm of nature literally shouts forth the reality of the all-powerful Maker Who alone accounts for the intelligent design of the created order. As the psalmist so eloquently affirmed: “The heavens declare the glory of God; and the firmament shows His handiwork.... There is no speech, nor language where their voice is not heard. Their line has gone out through all the earth, and their words to the end of the world” (Psalm 19:1-4). Only a foolish person would conclude there is no God (Psalm 14:1). The only plausible explanation for the Universe and the entire created order is “the great God who formed everything” (Proverbs 26:10). “O Lord, how manifold are Your works! In wisdom You have made them all. The earth is full of Your possessions” (Psalm 104:24). We can know there is a God. The Creation declares the reality of the Creator. To repeat Paul’s declaration in Romans: “For since the creation of the world His invisible attributes are clearly seen, being understood by the things that are made, even His eternal power and Godhead, so that they are without excuse” (1:20). 1 See Jørn Aas, et al. (2005), “Defining the Normal Bacterial Flora of the Oral Cavity,” Journal of Clinical Microbiology, 43(11):5721-5732, November; Human Oral Microbiome Database (2015), http://www.homd.org/. 2 See Leo Africanus (1896 reprint), The History and Description of Africa, trans. John Pory (London: Hakluyt Society), 3:951-952, https://archive.org/details/historyanddescr02porygoog; Robert Curzon (1851), A Visit to the Monasteries in the Levant (New York: George P. Putnam), 1:131, https://goo.gl/PRGnsJ; “Egyptian Plover” (2014), Bird Forum, http://www.birdforum.net/opus/Egyptian_Plover; “Endangered Crocodiles and Caimen” (no date), 50 Birds, http://www.50birds.com/animals/endangered-alligators-2.htm; Thomas Howell (1979), Breeding Biology of the Egyptian Plover, Pluvianus Aegyptius (Berkeley, CA: University of California), pp. 3ff., https://goo.gl/n6WCRn; Richard Meinertzhagen (1959), Pirates and Predators: The Piratical and Predatory Habits of Birds (London: Oliver & Boyd); “Nature in Egypt” (no date), http://traditionalegypt.co.uk/egypt/nature-in-egypt.php; Alfred Newton (1899), A Dictionary of Birds (London: Adam & Charles Black), pp. 442,732-733, https://goo.gl/1y0MbY; “Nile Crocodile” (no date), MediaLibrary.org, http://medlibrary.org/medwiki/Nile_crocodile#cite_note-26; “Nile Crocodile” (2015), National Geographic, http://animals.nationalgeographic.com/animals/reptiles/nile-crocodile/; “Nile Crocodile (Crocodylus niloticus), 2010” (2015), San Diego Zoo Global Library, http://ielc.libguides.com/sdzg/factsheets/nile_crocodile; Grace Norton, ed. (1908) The Spirit of Montaigne (Boston, MA: Houghton, Mifflin & Company), p. 78, https://goo.gl/KwULiY; Henry Scherren (1907), Popular Natural History (New York: Cassel & Company), pp. 268-269, https://goo.gl/9DLqQy; Philip Sclater (1893), The Ibis (London: Gurney and Jackson), vol. 5, 6th series, pp. 275-276, https://archive.org/details/ibis10uniogoog. 3 See Ram Gal and Frederic Libersat (2008), “A Parasitoid Wasp Manipulates the Drive for Walking of its Cockroach Prey,” Current Biology, 18:877-82, June 24; Ram Gal and Frederic Libersat (2010), “A Wasp Manipulates Neuronal Activity in the Sub-Esophageal Ganglion to Decrease the Drive for Walking in Its Cockroach Prey,” PLoS One, 5:e10019, http://www.ncbi.nlm.nih.gov/pmc/articles/PMC2850919/; G. Haspel, L.A. Rosenberg, and F. Libersat (2003), “Direct Injection of Venom by a Predatory Wasp into Cockroach Brain,” Journal of Neurobiology, 56:287-92, September 5, http://www.ncbi.nlm.nih.gov/pubmed/12884267/; G. Haspel, E. Gefen, et al. (2005), “Parasitoid Wasp Affects Metabolism of Cockroach Host to Favor Food Preservation for its Offspring,” Journal of Comparative Physiology, 191:529-34, June, http://www.ncbi.nlm.nih.gov/pubmed/15864597/; Frederic Libersat (2003), “Wasp Uses Venom Cocktail to Manipulate the Behavior of Its Cockroach Prey,” Journal of Comparative Physiology, 189:497-508, July, http://www.bgu.ac.il/life/Faculty/Libersat/pdf/JCP.2003.pdf; Eugene Moore, Gal Haspel, Frederic Libersat, Michael Adams (2006), “Parasitoid Wasp Sting: A Cocktail of GABA, Taurine, and -alanine Opens Chloride Channels for Central Synaptic Block and Transient Paralysis of a Cockroach Host,” Journal of Neurobiology, 66:811-820, July, http://onlinelibrary.wiley.com/doi/10.1002/neu.20254/abstract. 4 See Frank Aylward, Kristin Burnum-Johnson, et al. (2013), “Leucoagaricus gongylophorus Produces Diverse Enzymes for the Degradation of Recalcitrant Plant Polymers in Leaf-Cutter Ant Fungus Gardens,” Applied and Environmental Microbiology, 79:3770-3778, June, http://aem.asm.org/content/79/12/3770.full.pdf+html; Matias Cafaro, et al. (2011), “Specificity in the Symbiotic Association Between Fungus-Growing Ants and Protective Pseudonocardia Bacteria,” Proceedings of the Royal Society B, 278:1814-1822, http://rspb.royalsocietypublishing.org/content/royprsb/278/1713/1814.full.pdf; Eric Caldera, et al. (2009), “Insect Symbioses: A Case Study of Past, Present, and Future Fungus-Growing Ant Research,” Environmental Entomology, 38:78-92, February, http://ee.oxfordjournals.org/content/38/1/78; Cameron Currie, Ulrich Mueller, and David Malloch (1999), “The Agricultural Pathology of Ant Fungus Gardens,” Proceedings of the National Academy of Sciences USA, 96:7998-8002, July, http://www.pnas.org/content/96/14/7998.full.pdf; Cameron Currie, Michael Poulsen, et al. (2006), “Coevolved Crypts and Exocrine Glands Support Mutualistic Bacteria in Fungus-Growing Ants,” Science, 311:81-83, January 6, http://www.sciencemag.org/content/311/5757/81.abstract; Hermógenes Fernández-Marín, Jess Zimmerman, et al. (2006), “Active Use of the Metapleural Glands by Ants in Controlling Fungal Infection,” Proceedings of the Royal Society B, 273:1689-1695, March, http://rspb.royalsocietypublishing.org/content/royprsb/273/1594/1689.full.pdf; Hermógenes Fernández-Marín, David Nash, et al. 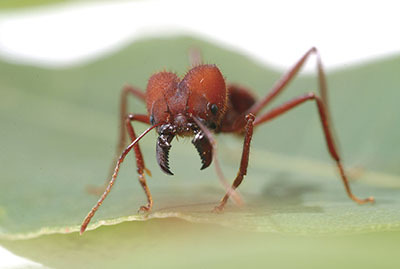 (2015), “Functional Role of Phenylacetic Acid from Metapleural Gland Secretions in Controlling Fungal Pathogens in Evolutionarily Derived Leaf-Cutting Ants,” Proceedings B, 282:20150212, April 29, http://rspb.royalsocietypublishing.org/content/282/1807/20150212; Susanne Haedera, Rainer Wirthb, et al. (2009), “Candicidin-Producing Streptomyces Support Leaf-Cutting Ants to Protect Their Fungus Garden against the Pathogenic Fungus Escovopsis,” Proceedings of the National Academy of Sciences USA, 106:4742-4746, http://www.pnas.org/content/106/12/4742.full.pdf; Ainslie Little, Takahiro Murakami, et al. (2006), “Defending against Parasites: Fungus-Growing Ants Combine Specialized Behaviours and Microbial Symbionts to Protect Their Fungus Gardens,” Biology Letters, 2:12-16, August, http://rsbl.royalsocietypublishing.org/content/roybiolett/2/1/12.full.pdf; Ainslie Little and Cameron Currie (2007), “Symbiotic Complexity: Discovery of a Fifth Symbiont in the Attine Ant-Microbe Symbiosis,” Biology Letters, 3:501-504, August, http://rsbl.royalsocietypublishing.org/content/roybiolett/3/5/501.full.pdf; Lucas Meirelles, Scott Solomon, et al. 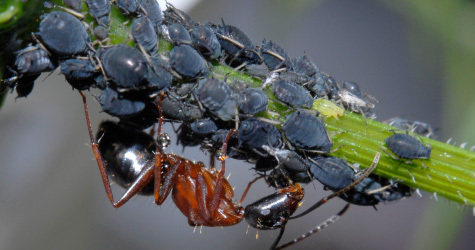 (2015), “Shared Escovopsis Parasites Between Leaf-Cutting and Non-Leaf-Cutting Ants in the Higher Attine Fungus-Growing Ant Symbiosis,” Royal Society Open Science, 2:150257, http://rsos.royalsocietypublishing.org/content/royopensci/2/9/150257.full.pdf; Ulrich Mueller and Nicole Gerardo (2002), “Fungus-Farming Insects: Multiple Origins and Diverse Evolutionary Histories,” Proceedings of the National Academy of Sciences USA, 99:15247-15249, November 26, http://www.pnas.org/content/99/24/15247.full.pdf; Hannah Reynolds and Cameron Currie (2004), “Pathogenicity of Escovopsis weberi: The Parasite of the Attine Ant-Microbe Symbiosis Directly Consumes the Ant-Cultivated Fungus,” Mycologia, 96:955-959, September/October, http://www.mycologia.org/content/96/5/955.abstract; Andre Rodrigues, Ulrich Mueller, et al. (2011), “Ecology of Microfungal Communities in Gardens of Fungus-Growing Ants (Hymenoptera: Formicidae): A Year-Long Survey of Three Species of Attine Ants in Central Texas,” FEMS Microbiological Ecology, 78:244-255, http://femsec.oxfordjournals.org/content/femsec/78/2/244.full.pdf; Hassan Salem, Laura Florez, et al. (2015), “An Out-of-Body Experience: The Extracellular Dimension for the Transmission of Mutualistic Bacteria in Insects,” Proceedings of the Royal Society B, 282:20142957; Christopher Trantera, Lauren LeFevreb, et al. (2015), “Threat Detection: Contextual Recognition and Response to Parasites by Ants,” Behavioral Ecology, 26:396-405, http://beheco.oxfordjournals.org/content/26/2/396.abstract; Mingzi Zhang, Michael Poulsen, and Cameron Currie (2007), “Symbiont Recognition of Mutualistic Bacteria by Acromyrmex Leaf-Cutting Ants,” The ISME Journal, 1:313–320, June, http://www.nature.com/ismej/journal/v1/n4/full/ismej200741a.html. 5 See W.P. Armstrong (1999), “The Yucca and Its Moth,” Zoonooz, 72:28-31, April, http://waynesword.palomar.edu/ww0902a.htm; Henry Brean (2011), “Joshua Tree, Yucca Moth Co-Evolution Fascinates Researchers,” Las Vegas Review-Journal, April 18, http://www.reviewjournal.com/news/water-environment/joshua-tree-yucca-moth-co-evolution-fascinates-researchers; Beatriz Moisset (no date), “Yucca Moths (Tegeticula sp. ),” United States Department of Agriculture Forest Service, http://www.fs.fed.us/wildflowers/pollinators/pollinator-of-the-month/yucca_moths.shtml; Olle Pellmyr (1997), “Prodoxidae: The Yucca Moth Family (Version 13),” The Tree of Life Web Project, http://tolweb.org/Prodoxidae/11872/1997.01.13; Olle Pellmyr and John Thompson (1992), “Multiple Occurrences of Mutualism in the Yucca Moth Lineage,” Proceedings of the National Academy of Sciences USA, 89:2927-2929, April, http://www.pnas.org/content/89/7/2927.full.pdf; Olle Pellmyr, John Thompson, et al. (1996), “Evolution of Pollination and Mutualism in the Yucca Moth Lineage,” The American Naturalist, 148:827-847, November, http://www.jstor.org/stable/2463408?seq=1#page_scan_tab_contents; Marylee Ramsay and John Richard Schrock (1995), “The Yucca Plant and the Yucca Moth,” The Kansas School Naturalist, 41, June, http://www.emporia.edu/ksn/v41n2-june1995/; Carol Sheppard and Richard Oliver (2004), “Yucca Moths and Yucca Plants: Discovery of ‘the Most Wonderful Case of Fertilisation,’” American Entomologist, 50:32-46, Spring, http://entomology.wsu.edu/wp-content/uploads/2012/02/yucca2.pdf; J. Arthur Thomson (1922), The Outline of Science (New York: G.P. Putnam’s Sons), 1:76,79; “Yucca Moth” (no date), DesertUSA, http://www.desertusa.com/animals/yucca-moth.html. 6 As quoted in Brean. 7 See “Aphid Control with Aphidius & Aphelinus Parasites” (2015), Greenmethods.com, https://greenmethods.com/aphidius/; “Cunning Super-Parasitic Wasps Sniff Out Protected Aphids and Overwhelm Their Defenses” (2012), ScienceDaily, 24, February, BioMed Central Limited, www.sciencedaily.com/releases/2012/02/120224110739.htm; B.M. Drees and J. Jackman (1999), Parasitic Wasp. Field Guide to Texas Insects (Houston, TX: Gulf Publishing Company); Lukas Gehrer and Christoph Vorburger (2012), “Parasitoids as Vectors of Facultative Bacterial Endosymbionts in Aphids,” Biology Letters, 8:613–615, March 14, http://rsbl.royalsocietypublishing.org/content/8/4/613; Paul Gross (1993), “Insect Behavioral and Morphological Defenses Against Parasitoids, Annual Review of Entomology,” 38:251-27, January; Kerry Oliver, J.A. Russell, N.A. Moran, M.S. Hunter (2003), “Facultative Bacterial Symbionts in Aphids Confer Resistance to Parasitic Wasps,” Proceedings of the National Academy of Sciences, 100:1803; Kerry Oliver, Koji Noge, Emma Huang, Jamie Campos, Judith Becerra, and Martha Hunter (2012), “Parasitic Wasp Responses to Symbiont-Based Defense in Aphids,” BMC Biology, 10:11, http://www.biomedcentral.com/1741-7007/10/11; “Parasitic Wasps & Aphids” (no date), National Geographic, Youtube, https://www.youtube.com/watch?v=rLtUk-W5Gpk; “Parasitic Wasps, Order Hymenoptera” (no date), Symbiont, http://www.drmcbug.com/parasitic.htm; E. Wajnberg, C. Bernstein, and J. Van Alphen (2008), Behavioral Ecology of Insect Parasitoids—From Theoretical Approaches to Field Applications (UK: Blackwell Publishing). 8 See N. Bluthgen, N.E. Stork, and K. Fiedler (2004), “Bottom-Up Control and Co-Occurrence in Complex Communities: Honeydew and Nectar Determine a Rainforest Ant Mosaic,” Oikos, 106:344-358; M. Doebeli and N. Knowlton (1998), “The Evolution of Interspecific Mutualisms,” Proceedings of the National Academy of Sciences of the United States of America, 95:8676-8680; B. Holldobler and E.O. Wilson (1990), The Ants (Cambridge, MA: The Belknap Press of Harvard University Press); B. Holldobler and E.O. Wilson (1994), Journey to the Ants (Cambridge, MA: The Belknap Press of Harvard University Press); Naomi Pierce, Michael Braby, et al. (2002), “The Ecology and Evolution of Ant Association in the Lycaenidae (Lepidoptera),” Annual Review of Entomology, 47:733-771; V. Rico-Gray and P. Oliveira (2007), The Ecology and Evolution of Ant-Plant Interactions (Chicago, IL: University of Chicago Press); Bernhard Stadler and Anthony F.G. Dixon (2008), Mutualism: Ants and Their Insect Partners (Cambridge: Cambridge University Press); J.J. Stachowicz (2001), “Mutualism, Facilitation, and the Structure of Ecological Communities,” BioScience, 51:235-246, March. 9 Cf. Ed Grabianowski (2008), “How Symbiosis Works,” HowStuffWorks.com., March 7, http://science.howstuffworks.com/life/evolution/symbiosis2.htm; Durr Aanen and Ton Bisseling (2014), “The Birth of Cooperation,” Science, 345:29; Erik Hom and Andrew Murray (2014), “Niche Engineering Demonstrates a Latent Capacity for Fungal-Algal Mutualism,” Science, 345:94. 10 Antony G.N. Flew and Thomas B. Warren (1976), The Warren-Flew Debate on the Existence of God (Jonesboro, AR: National Christian Press), p. 25. 11 Jerry Fausz (2007), “Design Rules,” Reason & Revelation, 27:49-52, http://apologeticspress.org/apPubPage.aspx?pub=1&issue=591. 12 Fred Hoyle (1981), “Hoyle on Evolution,” Nature, 294:105, November 12. 13 Fred Hoyle and Chandra Wickramasinghe (1981), Evolution from Space (London: J.M. Dent & Sons), pp. 141,144, emp. in orig. 14 Richard Dawkins (1982), “The Necessity of Darwinism,” New Scientist, 94:130, April 15, emp. added.